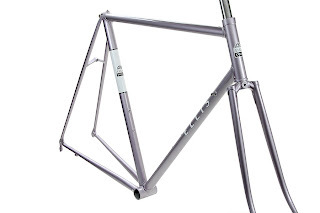 The latest Ellis is a cyclocross bike for Juan. 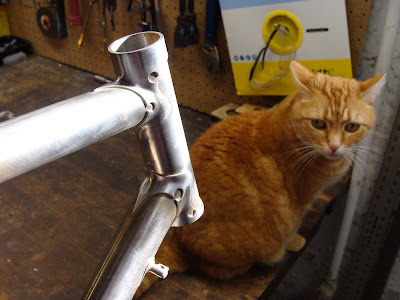 We decided to use Sachs' Rene Singer stainless lugset and it's going to have all the lugs polished except the bottom bracket. All the parts mitered and ready for the fixture. 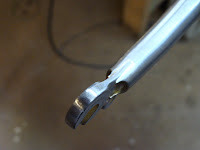 If you look close you can see how I modified the lugs to allow for the tight angles. 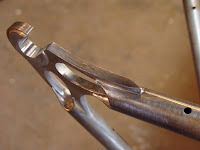 The cutouts in the spoons of the lugs allow them to be "massaged" to slightly different angles. 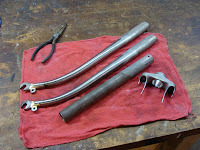 The fixture, on the left, the tubes mitered, and on the right the lugs are on and set. On the right, you can see the inspector stopped by to make sure everything is OK. 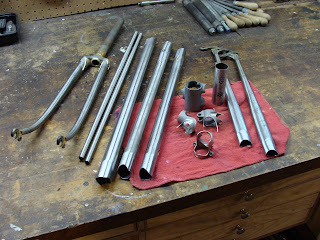 The fork parts ready to load into the fork fixture, and the fork after brazing. 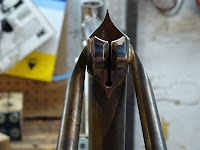 After some quality file and emery work, the front dropouts looking sharp. 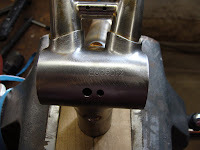 Head lugs all finished and ready for polishing. 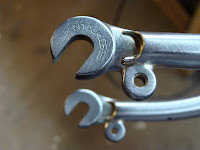 You can see the circular cutouts on the spoons of the lugs. 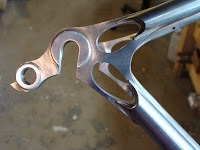 Rear dropouts and bb shell. 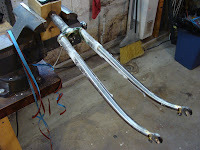 The seatlug, I'm going to braze on the cable guide and rack mounts after polishing. 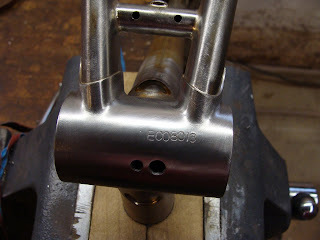 Keyhole detail on the front of the headlugs. 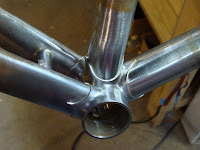 The fork crown is also stainless and will be polished. Well, I haven't been keeping up with James' cross racing exploits, so here's a recap of the past few weeks. At the Washington park race on Oct. 26, James scored a 4th place. 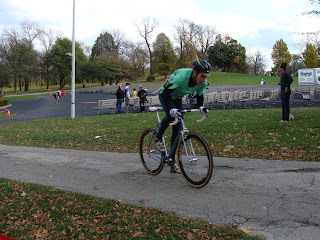 This being right before Halloween, James rode as Peter Pan, and managed to keep his sword with him through the entire race! The following weekend was a double header with Kletzsch Park on Sat. and Eastabrook on Sun. Unfortunately, I had to work on Sat, but Al Haas took some great photos of the race and James on his way to a solid 3rd place. Sunday at Eastabrook was a fun day because Lisa and I borrowed a tent from Vince at Ben's and set up a little Ellis Cycles display right along side the course. Met a bunch of great folks, helped out with some mechanical stuff and got to watch James take another 3rd! Unfortunately in packing the tent, tools, bikes and other stuff, I forgot the camera, so both photos are from Sat. 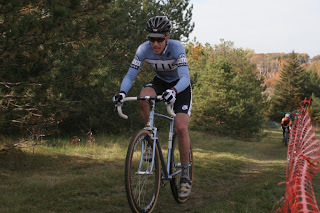 On the 9th, James went south of the border into Illinois to race at Northbrook and took a 2nd place. Finally, this past Sat. he jumped the border into Minnesota to ride their state championship and after a race he described as "faster than any Wisconsin race" he'd done, he took 4th. Congratulations James! 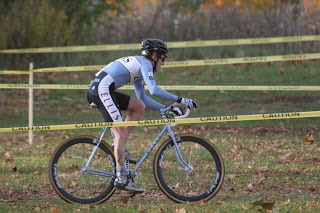 For a play by play of the championship, check out; http://www.bikethrow.com:80/i/2008/11/15/sone-repeats-and-lemieux-captures-state-cx-titles-at-bassett-creek/. 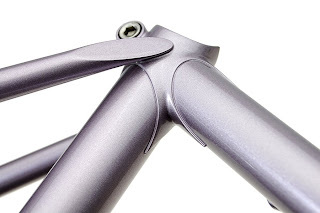 I liked the description of James' sweet single speed, but I admit I'm biased. The cross season is winding up, but it should just get more exciting from here. Next weekend is the WI state championship in Hales Corners, and we'll be there cheering James on. After that it's on to the Illinois championship in 2 weeks and then on to the Nationals in Kansas City on Dec. 14th. Lisa's got the time off and we're planning on making the trip, should be fun, and we'll see you there! 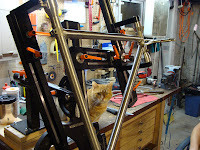 Jason finished up Josh's frame last week, it's a pretty simple, classic paint scheme. I used Henry James lugs with just a few little modifications. 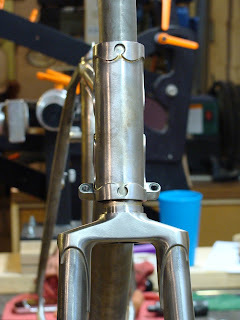 I added the circular cutouts on the chain stay points like my road frame. On the fork, it was circles again on the inside and outside. 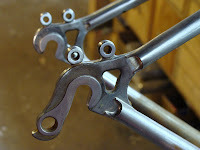 The rear dropouts are Ritchey's, but I finish them down quite a bit. 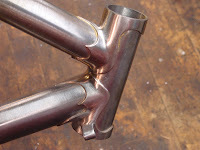 The seat lug is just clean and simple with side tack seat stays. 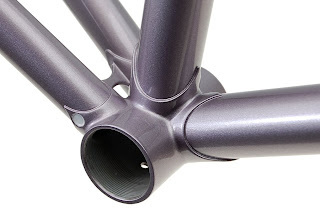 The head lugs get the small circular cutouts in the corners, and you can see the internal brake routing. 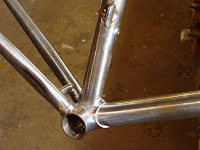 Rafael's frame is heading off to Jason's for paint. 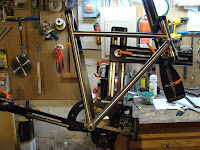 Here's some shots of the finished frame. 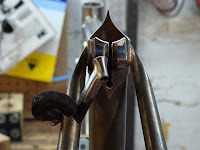 The head lugs and cable guides. 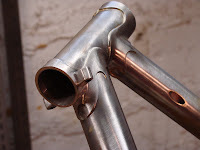 A couple views of the bottom bracket, Ellis Cycles #12. I decided to finish the internals a bit more than I showed in the previous blog posting. Rafael went for the fastback seat stay, nice and tidy. 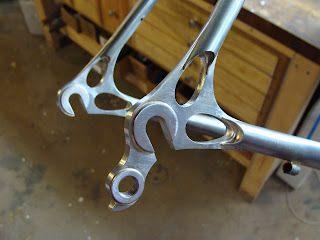 My favorite part, the Ellis dropouts. 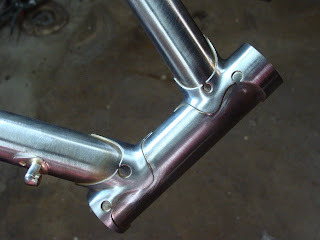 I left the bottom of the dropout raised and finished it to a point. 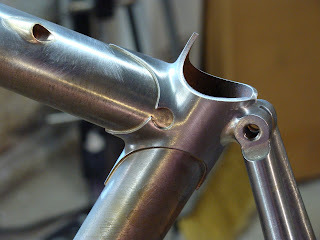 Since the dropouts are stainless, I'll have Jason mask this part so no more chewed up paint from wheel changes.